When I listen to Eric Clapton play the blues I am in awe. How he can bring both freshness and his unique style while unabashedly paying homage to so many of his blues heroes is a true testament to his abilities. Listen to this disc and you will know Eric Clapton's roots have never changed. This is in many ways recycled Eric Clapton. This CD depicts the best blues songs he has ever done. Just that alone makes it a great CD. The vast majority are on other albums and box sets. I am gonna dwell on the songs that are new. "Before you accuse me" is strong, in fact both versions are new, however the version on Journeyman is the best of the three. Four if you include the version on Unplugged with is very good. In my mind the Version on Journeyman is the best of the four. These however are worth the listen. Cryin appears on Crossroads 2 and to me is a very strong acccoustic blues song. One of my favourite EC blues songs. Alberta which was written by Huddy Ledbetter (Leadbelly) is again a favourite and almost identical to the version on Unplugged. "Meet me down at the bottom" is an instrumental and to me sounds unfinished somehow. This is a solid CD and has EC at his finest playing blues. What else can you ask for? WOW! !, words cannot describe this album. Not only does Eric blow you away with raw emotional singing and some of the best guitar work I believe I have ever heard him play on a an album, but the rest of the bands are great. From Marcy Levys phenomenal vocals on "Stormy Monday" to George Terry "holding his ground" in comparison to Eric's "Have you ever Loved a Woman" solo (disc two). Weird though that I listen to the lesser known songs more than I do say "Crossroads" and "Before you Accuse Me". I think that "Further on up the Road" is absolutely superb and is now possibly my favourite song Clapton has ever done. I also love the versions of "Ain't That Loving You" and "Cryin'" two absolutely wonderful songs. 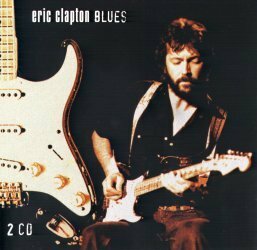 I would have to say that, if it's long, emotional solo's and awe-inspiring vocals you are looking for, Eric Clapton Blues is the only Clapton album you will need to fulfil your desires. Did i mention the cool pictures of Eric in the pamphlet thing? This was my third Clapton album after the Cream of Clapton and Reptile. I have to say I was literally blown away by the sheer emotion and power behind some of the tracks both vocally and with his Strat, but then the quieter tracks such as Alberta and Give Me Strength are touching from a man recovering heroin addiction. Blues is all I can play on my guitar now, anything else seems like a misuse of the instrument. This album deserves all the praise it gets and more! What can I say, 10/10 isn't enough. This is one of Eric's best albums. This rates very close to his wonderful album entitled "Unplugged". All Eric's live music is rated 10, but they shouldn't put on the second disk material from previous live albums, too commercial!!!! Best song is a very nice version of Crossroads, all other outtakes are very worthwhile. The first disc contains some wonderful material but could benefit from more previously unreleased material. The second disc is possibly the most beautiful, emotional live blues paying I have heard. The live version of 'Have you ever loved a woman' where Clapton literally lets the guitar do the singing in superb. All in all a very good collection.